How do master distillers create a gin recipe that works? and perspective, but what is the starting point for master distillers to compose their own masterpieces? ‘I think of a style of flavour, rather than any key botanicals. When creating the recipe for Bloom I wanted a floral profile, and then I went into more detail about what would constitute that,’ says Joanne Moore, master distiller, Quintessential Brands. Another approach is constructing a recipe in ‘layers’. ‘My approach is like a perfumer, first building the denser base notes, such as vanilla and pepper, then the top notes which are the lightest, including citrus and pine (from juniper), finally I build the bridge to the heart notes. Top notes appear first, followed by the heart notes, then the base notes take over. In Spirit of Hven Original Gin the heart notes are chamomile and elderberry, while in Spirit of Hven Navy Strength, which is a different recipe with a higher alcoholic strength, the heart is a lavender scent. The key to a great fragrance is having a smooth transition from the top notes to the heart notes, and then onto the base notes,’ says Henric Molin, founder and owner, Spirit of Hven Backafallsbyn, Sweden. Creating a recipe in-house may not always be feasible. No problem. Expertise is available, and only a phone call away. ‘We’re like a London tailor, we can do as much or as little as you like, whether it’s recipe development, or also producing the gin. The more detailed the brief the quicker we can produce a recipe. Some clients do some development work first and tell us which botanicals, and the ratios they want,’ says Charles Maxwell, director, Thames Distillers, who has an amazing record having created over 130 recipes (with more in development). Similarly, Rob Dorsett, master distiller, Langley Distillers, has created more than 50 recipes, with Langley Distillery also producing 350 gins on behalf of various clients. ‘The first thing we ask is what do you want in your gin? A client has to know what they want, then we can guide them,’ says Rob Dorsett. One desirable feature is a distinctive botanical, which can certainly help a gin stand out from the crowd. But it must also fulfil certain criteria. A growing interest in provenance also means a ‘local’ botanical can play a significant role. ‘We wanted something from the Cotswolds, unfortunately we couldn’t include local juniper as it has a lower level of essential oils than the juniper we source from Macedonia and Italy. I’ve always loved lavender, and it’s one of the few botanicals that could define the Cotswolds. 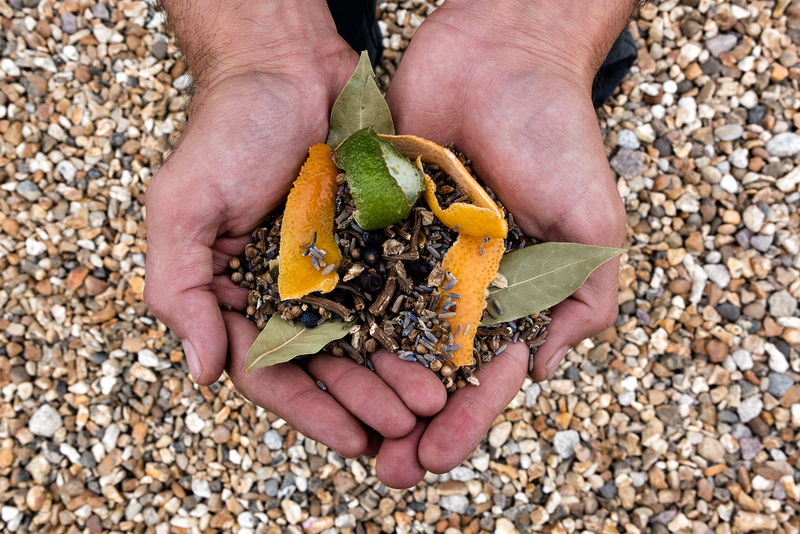 We found a great source of lavender 10 miles from the distillery, which provides a subtle, background note, as if you use too much lavender it can resemble potpourri,’ says Daniel Szor, founder and CEO, The Cotswold Distilling Company. The creativity of recipe development is also accompanied by stringent practicalities. ‘Distilling a product that’s going to be ingested by people means we have an extremely important responsibility. We need to know where the botanicals come from and the supply chain, that they’re reliably, sustainably and ethically sourced, and that there are no toxins involved, as some botanicals contain properties that can be toxic at certain concentrations. Additionally, strict regulations in some countries forbid certain ingredients, so you need to understand all the potential consequences,’ says Joanne Moore. Once a recipe has been created in a distiller’s mind, it’s time for a trial run. Joanne Moore uses a glass pot still in the lab, which produces a sample of spirit that’s around 0.5 litres. A glass still is also used at Langley Distillery, producing 5 litres of spirit, while at Cotswold Distilling a small copper pot still yields around 0.5 litres. This process needn’t be confined to a lab. Some of us take our work home with us, while for one distiller it’s already there. ‘In my home I have my own flavour lab, where I distil individual botanicals in a small still, and then experiment by blending them together. This is my preferred approach to flavour creation. Once I’ve finalised a recipe I distil the botanicals together,’ says Abhi Banik, head distiller, Copper Rivet. Once small-scale distillation is successfully concluded, it’s time to ‘scale up’. of replicating the proportions, as each year’s harvest can result in subtle, or significant differences. ‘We check each batch of juniper berries, and you do notice differences depending on the harvest and the origin. Botanical suppliers advise us if there has to be any change in sourcing, due to the weather. We do a sensory analysis first, then send a sample to the lab. If we’re getting significant differences in the level of essential oils, we do a trial distillation. To spread any potential risk, we have four suppliers of botanicals, from whom we can pick and choose samples,’ says Charles Maxwell. If adjustments are necessary, how is this calculated? ‘There’s a mathematical formula, so I know how to adjust the volume of botanicals, based on 20 years of seeing how things react. But there’s also an element of trial and error,’ says Joanne Moore. So, where do we go from here? With so many new recipes in the past 10 years, how much scope is there for more?